The largest muscle group in the upper body are the chest muscles. Known as pectoralis major and minor (“pecs”), these muscles are thick and fan shaped. In order to target this muscle group, any good chest workout routine should focus on using heavy weights in exercises that target the inner, outer, upper, and lower pecs. Since the pecs are considered “pushing” muscles, they tie in closely with your shoulders and arms. This means that working out your chest will naturally work your deltoids and triceps as well. The weights used in your chest workout routine directly affect the size, spread, and depth of your pecs. Bench Press – this is often considered to be the “go to” chest exercise. There are many different ways to perform a bench press, using various grips, angles, benches, and weights. The only commonality is that each uses an Olympic bar with plate weights. The most basic bench press uses a wide grip on the bar while laying flat. This effectively puts more exertion on the outer pecs. Lowering the bar to the chest or neck also determines whether the upper or middle pecs are worked. It is easy to incorporate tricep and deltiod exercise into the bench press. By lowering the bar to the middle of the chest and keeping elbows at your side, triceps help in moving the weight. Alternatively, lowering the bar to your neck while keeping elbows wide and away from the body includes the frontal deltoids in the workout. In addition to the flat bench, many people include incline and decline benches in their chest workout routine. The incline bench will target the upper pecs when lowered to the neck. 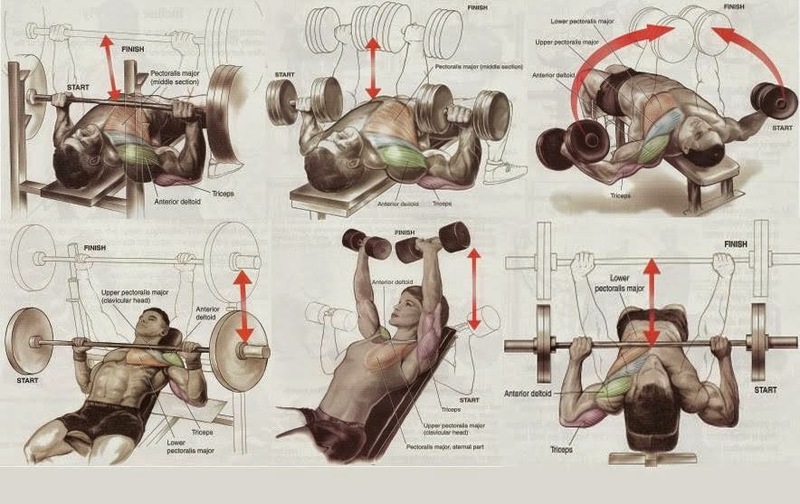 The lower pecs are worked when this is performed on the decline bench. Parallel Bar Dips – this exercise is extremely effecting for working the upper and inner pecs when hands are placed at shoulder width. Placing hands wider results in outer pec and deltiods being involved. Dumbbell Exercises – free weights can be incorporated into a chest workout routine in a number of different ways. Most of these exercises simply imitate or approximate bench press exercises, but with dumbbells instead of an olympic bar. In addition, flies can be performed on a flat, incline, or decline bench. This works well for stretching and tearing of the muscle. Cable and Pulley Machine – this machine is commonly used for chest finishing exercises. The two-handed crunch (similar to flies on a bench) starts with arms spread wide and bent at the elbow. The handles are then brought together in front of the chest. Bent Arm Pullover – With weight on the floor, the lifter lays back on a flat bench (supine position). You then reach back and grab the barbell from over your head. While keeping arms bent, the weight is brought up the the chest in fluid motion. This exercise effectively stretches chest muscles as well as deltiods and triceps. It is easy to compound this exercise. Once the weight has been pulled up to your chest, perform a bench press and then return the weight back to the floor. Most trainers agree that a solid chest workout routine starts with heavier weight exercises (ie bench press), and then continues on through barbell and dumbbell exercises, ending with bodyweight exercises such as push-ups.